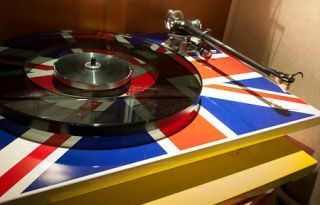 BRISTOL SHOW 2012: Rega flies the flag with special edition turntable | What Hi-Fi? One of the show's more eye-catching products is this special edition of Rega's R6 turntable. Available for a £40 premium on top of the R6's £798 standard price, this Union Flag edition is perfect for patriots in this Diamond Jubilee/London Olympics year. And it's not just Brits that can fly the flag. Rega says it's already made a deck featuring the Australian flag, with the US Stars and Stripes also in demand. "We can feature just about any flag customers want", the company claims.